Geo-blocking is one of the main challenges that internet users have to face as it prevents them from enjoying true online freedom. Those outside the United States are in disadvantage because they are not able to access popular content, simply because of their location. Thankfully, there are solutions that aim to help people around the world to defeat geographical restrictions. One of the services that focuses on allowing you to unblock the content you want, regardless of your location is Keenow Unblocker. Developed by Keen Media Group, Keenow Unblocker is a powerful service that can transform your online experience by making it more versatile. Let’s take a look a what Keenow offers. Keenow started as a completely free service that offered unlimited bandwidth to access US websites and users had to install an extension in order to use the unblocker. Although there is still a free version of Keenow, the company changed the way in which the service works and added a Premium plan. This has allowed Keenow to be a more reliable solution to defeat the restrictions imposed by the likes of Netflix. Keenow Lite is the free option and it only allows you to unblock US content. 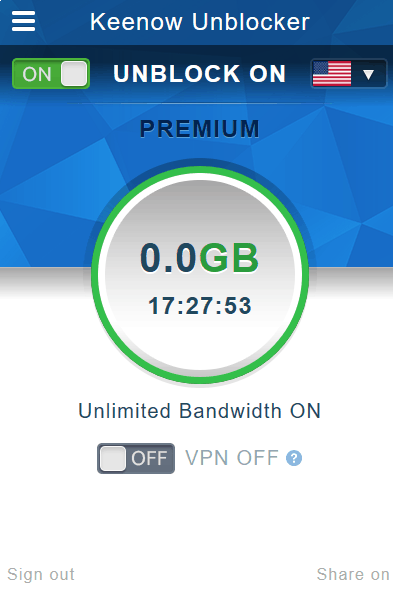 It has a daily data cap of 512MB and the VPN is not included. There is no virtual WiFi and users only get standard support. The Premium service offers unlimited bandwidth, Virtual WiFi and servers around the world so that you can unblock content from a wide variety of locations. It comes with a VPN solution that allows you to improve the security and privacy of your connection. You can also bypass ISP throttling and enjoy dedicated customer support. 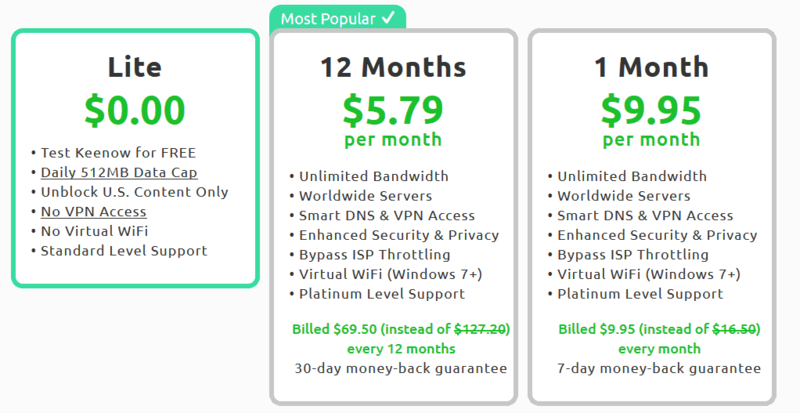 The Premium plan is the most effective way to defeat geo-blocking and it costs $9.95 per month, or $5.95 per month if you subscribe for a full year. The yearly plan costs $69.50 in total and it comes with a 30-day money-back guarantee, while the monthly option has a 7-day money-back guarantee. Keenow accepst different methods of payment, including Bitcoin. Keenow Unblocker focuses on giving users the chance to unblock websites and streaming services using Smart DNS technology. While VPNs offer stronger security, the encryption that they use can affect the speed of your connection. The advantage of Smart DNS is that enables you to bypass geo-blocks and censorship in a fast way. It is an ideal solution for defeating blocks to be able to stream HD content from a variety of sources. While Keenow Unblocker’s main purpose is to give users the chance to get around restrictions in order to access content from around the world, the Premium service includes a VPN for added security. However, Keenow Unblocker doesn’t aim to be a solution to enhance the protection to your online traffic. It is important to note that Keenow Unblocker doesn’t claim to be a privacy tool and it features a VPN solution, mainly as a backup to its core Smart DNS. In some instances a Smart DNS may not be enough to overcome the blocks imposed by streaming services like Netflix, but with a VPN the chances to access the content are increased. The VPN that Keenow offers as part of its Premium plan can also help you to boost your security when you are using public WiFi hotspots. It can also disguise your real IP address, which gives you some level of anonymity and privacy. Although the focus of the service is to unblock content, the VPN uses strong encryption through the most reliable and secure protocol available: OpenVPN. There are different configurations used, but the highest security is provided with AES-256-CBC and auth SHA512 for HMAC. RSA-4096 is used for handshake and the DH key size is 4096 bits. In terms of privacy, it is worth mentioning that Keenow is based in Israel, a location where the government is known for carrying out online surveillance. In addition, Keenow keeps multiple connection logs, including bandwidth usage and timestamps. This may not be a big concerns if what you only want is to bypass geo-blocking to stream content. However, if privacy is your priority, it is something that should be kept in mind. The Premium version of Keenow Unblocker combines the speed and convenience of Smart DNS with the security and reliability of a VPN service. Keenow Unblocker offers its own software with support for Windows, Mac, Android and iOS. The website offers detailed instructions to set up the Smart DNS and the VPN service manually on several platforms. Keenow Unblocker can give you access to a large selection of websites and services. They have a step-by-step guide that will help you to configure the service to unblock Netflix effectively. The Keenow Windows app comes with a Virtual Router that gives you the possibility of setting up a new WiFi network that runs from your Windows device. This is a very practical feature that will allow you to enjoy the benefits of Keenow Unblocker across multiple devices, without worrying individual configurations. Simply connect to the KeenowUnblocker WiFi network to get the protection and online freedom of the Keenow VPN running on your Windows device. Keenow has servers in nearly 20 countries including Australia, United States, Japan, Mexico, Spain, United Kingdom, Poland, Brazil, India, the Netherlands, France, South Africa, Germany, Canada and Russia. P2P torrenting is allowed in servers in the US and the Netherlands. The website features helpful sections such as a detailed FAQ, a troubleshooting wizard and setup guides for all the platforms supported. If needed, you can also get in touch with the customer support team via email-based ticket system. Customers who use the free version of the service may have to wait a bit longer for an answer, but the responses are prompt and professional. You get a lot of information that will help you to solve your query and solve any issue you may experience. Thanks to Keenow Unblocker you won’t need to settle down for the limited content offered in your location. You can explore international content and access websites or streaming services that are blocked in your country. Keenow Unblocker is a practical solution to bypass geo-restrictions and with the added VPN in the Premium service, you can enjoy some privacy and security, although these are not the main goals of Keenow Unblocker. Still, the service offers remarkable security and the software includes practical features. The free solution is convenient and the Premium plan offers advanced technology, affordability and great performance.